I would like to begin this article with a quick disclaimer: I believe that Reach is canon. I am a believer in the priority of source, which is just a fancier way of saying "games have priority." This will be explained in a different article. But what I don't believe, however, is that it's perfect. This article is about where I think Reach failed. In narrative art and writing, there is a method to portraying a character: the less detailed that character is (art: the fewer physical details presented; writing: the fewer emotional reactions described), the more the reader can and will project himself/herself onto that character. That's how we come to put ourselves in their shoes, get personally involved in their struggle, and ultimately feel the triumph (or failure) of their mission. Here is where the terms "silent protagonist" and "quiet protagonist" enter the picture for video games, and where Halo is said to thrive. In four out of five Bungie titles for the series, we are given a quiet protagonist: the Master Chief and Noble Six. 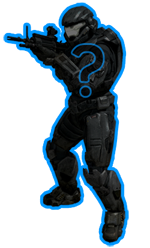 In ODST, we have the first true silent protagonist: the Rookie. Beyond how well a reader/player can relate to a character, there are established ways of determining how a character operates within a story: dynamic, static, rounded, or flat. If you passed high school English, you probably know most of this already, but let me sum it up in case you've forgotten: dynamic refers to a character who changes over the course of a story; static refers to a character who doesn't have any major change; rounded refers to a character who has depth and multiple emotional angles; flat refers to a character with only one emotional angle and often only serves a single purpose in the story. Obviously there are stigma associated with some of these words, but it's important to remember that each type of character has a place in a story. We need static characters to serve as yardsticks (dare I say waypoints) to judge how much the main character has changed, just like we need flat characters to fill up the background. Too much dynamism will make your plot a tangled mess of characters changing and changing; too much roundness will make your characters too busy and overload the reader/player with information. But where's the one place you don't want those background qualities? In your main character. So how do the qualities translate into a quiet or silent protagonist? The answer: not well. It's hard to portray change in a character who, by definition, must show as few detailing characteristics as possible. Halo: Combat Evolved did pretty well by the Master Chief, and the role of the Rookie in ODST was more to be a Watson character than any major player. So where did Reach go wrong? First of all, Master Chief was alone and spoke more to us through his actions. I remember when he discovered the dead body of Mendoza just prior to the Flood outbreak. He picks up Jenkins's helmet and shakes his head, shoulders heaving ever so slightly. This is not a man merely breathing, he's a soldier who is reflecting on a long history of war and the dead. There are other moments, of course, but those stick out particularly in my mind. Now comes Noble Six. How do we figure out he's a grizzled vet? We don't. It's mentioned that he's a "Lone Wolf" only through the characters, otherwise he seems a perfectly adjusted member of a team. The mistake here comes from Bungie's desire to make that blank canvas but also simultaneously have that canvas be part of a team. The result is less of the confident feeling in the character (from the moment the Master Chief stepped out of that cryo tube we knew he was a badass) but also a lack of confidence in the team around him. Actions really do speak louder than words. If I was to suggest an alternative (though I'm certainly not brash enough), perhaps Bungie should have nixed half the dialogue in the opening cutscene, and when the Zealots show up Six rushes off after them alone. When he returns, Carter berates him despite his victory, and also because Six let the leader get away while hunting down the other two in bloodlust. Later, when Carter covers for Noble Six in front of Halsey (to no avail, because it's Halsey and she's the most intelligent person on the planet), it shows solidarity between him and Six -- the first piece of friendliness Six is shown as part of the team. Another contributing factor is, quite frankly, the inconsistent voice acting. I'm not intimately familiar with how the female Six is, but I've played through several times with the male model. Six has very few lines, so it's important how they're delivered. Yet the tone of voice is wildly different from one line to the next. I couldn't get a read on his character. Which brings us right back to the blank canvas. We're supposed to be able to project whatever personality we want on Six -- presumably our own, but it could be anyone. Yet the delivery of the lines suggests various and often disparate personalities: neutral ("Got it, sir. "), gruff ("Found something. "), cooperative ("Well, I aim to please. "), back to gruff ("That's a one way trip."). By the end he sort of settles into mournful ("Not just me, sir. "), but the damage is done. Idiot paragraph: I do appreciate the connection at the end. No matter how poorly, it's established early that Six is a Lone Wolf, probably doesn't care much for the team environment despite not showing it very well. Yet by the conclusion, he's torn up by the loss of his team. Bungie's mistake was simply trying to follow the same formula for their ever-popular plot story in their character story. As the tag line says: "From the beginning, you know the end." It can't be a plot story because we already know what happens, that Master Chief is the last Spartan at the start of Halo: Combat Evolved. Having a shocking ending wasn't the point, it was being able to lose yourself in the setting (which they accomplished nicely) and in the characters (which was substantially weaker). Maybe we should have been given a strong character, a Spartan character, sure of deed while terse of word. For it, Reach may have been a much stronger game.